Upgrading your side mirrors on a pickup truck or rv is not a cheap investment. We found that out right when we began our frugal rv lifestyle. Because we were towing a modest sized travel trailer, actually installing huge side arms would be overkill anyway! We had to be safe and figure out a solution, but we wanted it to be temporary, not permanent. We didn't want those big mirrors permanently attached to our truck anyway. We were skeptical about universal, clip-on mirrors, but boy were we wrong. Cheap and they worked perfectly...what more could we ask for? We Found Our Best Clip On Towing Mirrors, Thankfully! When we became fulltime rvers, clip on towing mirrors became our immediate best friends. Pulling a 30 foot travel trailer behind us, we learned quickly that our side mirrors were not going to do the trick. In fact, it was quite dangerous to tow the rv with such limited visibility. But living the frugal rv lifestyle, we were not financially able to make a large investment, so we began reviewing and searching any information we could find on extensions that would slide on or slip on over our existing mirror. 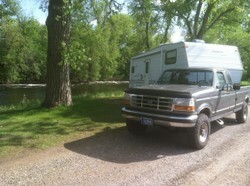 We were pulling our 1993 Award Travel Trailer with a 2006 Nissan Frontier pickup truck. The width of the travel trailer coupled with the narrowness of our truck made for a dangerous area of blind spot. We researched all of the products we could find, then decided to try the Fit System...and couldn't have been more pleased with the results. That was back in 2009 - now, in 2016, we have a different truck and camper...and we still use them, as you can see in the photo below! They were the best little investment that kept us safe and did exactly what they were meant to do....through wind and snow and sleet and hail. Usually I am notorious for long rv tip/lifestyle articles, but this one is short and sweet. Why? Because we have been using them for 6 years and have zero complaints! What else can I possibly say?? We have no complaints about these affordable truck towing mirrors to this day... not a one. They fit any side view mirror on any vehicle, up to 11.5 inches in height. Even the narrowest SUV and pickup can gain a large visual field with these universal extenders attached. The mirrors (our regular model) are 5" x 7" which provides adequate area for viewing. If you are anything like us, we can put your fears of them flying off down the highway, vibrating or slipping, to rest. It never happened - even in the worst weather conditions. These are, by far, the best value out there for such a great performing mirror. What we liked most is that, because they aren't excessively long, we didn't feel the need to constantly take them on and off, on and off, when the camper wasn't attached. We left them on a lot, without the rv. Those permanent extended arm mirrors really stick out there, which isn't convenient when not towing an rv. We have changed RVs and vehicles many times since starting off in 2009, but our tow mirrors always come with! We just love them...and the price. For ONCE you get value for your money, instead of "what you pay for." Highly recommend these...but don't forget to order two of them, they are sold individually! Universal Camper Towing Mirrors Comments? frugalrvers, Your photo indicates that they must not look too weird since they photograph quite nicely. What is their expected life expectancy?